YSI's ISS division can provide design assistance through complete turn-key installation and maintenance for a variety of monitoring networks, including stormwater stations. With decades of experience in-house and direct training and resources from manufacturing, ISS has the expertise to handle the detailed logistics for professional grade installations and to insure your instrumentation is installed correctly for proper data collection. In addition to selling standard Systems products, YSI is able to complement hardware supply with design, installation, customization, and maintenance services. Projects from one site to 300 have been completely managed by the Services group. Field experience, and it alone, brings understanding and preparedness for the logistical and ever-changing challenges presented by remote, outdoor locations. We deal with harsh environments, weather conditions, wildlife, sites that are only accessible by boats, airboats, helicopters and/or swamp buggies... and know how to mitigate these challenges and still construct robust, high quality monitoring platforms etc., on time and within budget. YSI understands the importance of proper mounting of sensors to ensure they meet their specifications, provisioning for security of system equipment, allowances to ease maintenance and calibration, all while allotting for easy access and future growth requirements. Construction and Installation Services can include civil work, hardware installation and full system implementation. The Civil component includes walkway, boardwalk and/or platform construction, concrete work, tower and mast installations and setting of walk-in instrument housings, etc. Have questions about Field Design & Installation? YSI Custom designed 15+ stormwater monitoring stations throughout South Carolina for Woolpert Engineering and several of their municipal clients. 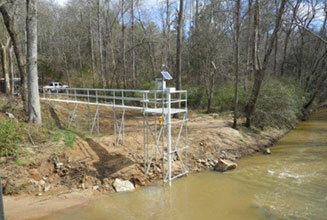 YSI provided instrumentation, site design, installation, telemetry, integration and programming.